This post is about restaurants in La Seu, the area around the cathedral in the old town. I’ve also written separate posts on La Seu for tapas bars, stuff to see in the area, and drinking horchata. My map is here. For some reason (ease of parking under Plaça de la Reina? ), whenever I meet my local friends Angeles & Juan for a meal, it’s always at a restaurant in La Seu! I review four very good restaurants below, in reverse chronological order. I’d go with La Lola if I had to choose, because they have tables outside. Seu Xerea is owned by a British chef Steve Anderson. To my embarrassment he caught me eating olives with a fork while I was waiting for the others but thankfully he let me off for letting the side down! Angeles, Juan and I all had the €49 Menu de Degustacion (four small plates, two mains, two desserts) and additional €28 wine matching (six 100ml glasses). I was far too busy having fun to make any notes (the purpose of this blog is to entertain me when I’m by myself) so I can’t comment on which course or glass of wine was the best but I can tell you it was all very good. Anderson is known for his Valencian Oyster with Almond and Iberian Pork Belly. Next came Mediterranean Shrimp with Cucumber and Apple. Something else not mentioned on the menu matched with a local white called Angosto. Un-pasteurised Ricotta Gnocchi with Egg Yolk came with Casanova, a Ribeiro. Roast Octopus with Spicy Chorizo Breadcrumbs came with Edetana, a white Garnacha/Viognier blend. Fish of unknown type with Bouillabaisse Stock with a glass of Albarino called Ex Libris. Roast Lamb with Chargrilled Red Pepper needed a glass of red Ribera del Duero called Valtravieso. Strawberries with Pistachio and Cava went well with a Moscatel called Alambre. Dark Chocolate Mousse with Cherries finished us off. I’ll be back for the €35 tapas menu next time. Seu Xerea is handily opposite Café de las Horas, a favourite bar of mine (see La Seu tapas bars post) so you could start or finish there. This is a posh place in quiet square. The service was good and the wine list is extensive. The food was fine if I recall (all B) but nothing stunning. It’s the weakest of the four in this post but still good. To begin I had the Hatillo de Langostino y Queso Fresco, or langoustine and fresh cheese in a deep-fried bag of filo pastry. Hatillos seem to be a thing here as La Lola below does them as well. I had the Arroz Meloso de Cortijo: Caldo de Cocido, Longanzina, Jamon, Panceta, Garbanzos or a wet ‘farmhouse’ paella made with stew broth, sausages, cured ham, bacon and chick peas. To drink, a half-litre bottle of my old friend, Les Alcusses red wine for €10.50. The total cost was €30.85. I celebrated my birthday here with my friends Angeles, Juan, Karen and Nicky but I can’t remember much about it! Five of us had the tasting menu which consisted of Braised White Asparagus with a Vinaigrette of Cherries, Tuna Tartar with Ginger and Peach, Turbot Stuffed with Aubergine in a Veloute of Langoustines, Confit of Iberico Pork with Mash and to finish, Yogurt with White Chocolate Cream, Tonka Beans and Red Fruits. All I remember about the food is that it was all very good! Just a stones throw away from La Salvaora is the lovely Placa de Negret which is full of bars where you can sit outside. The most famous bar here is Cafe Negrito but it’s probably easier to get a seat at one of the other bars at busy times. You’ll find this friendly modern restaurant down a small back street next to the cathedral. I first came here on a warm summer evening at the suggestion of my dear old friend Angeles who is a local lass. Although I’d been aware of the restaurant before, I’d mentally put myself off going because their greeters hustle for custom on the street; generally a turn off for me because it smacks of desperation. I realise now this was a little unfair because the food was absolutely fine (including the very reasonably priced set menu), it’s more that the place is a little hard to find. In terms of the food, the Salmorejo was very tasty (A) and the attractive looking Goats Cheese starter was nice as well (B), as was the Bacalao with sauteed vegetables (B+). I can’t remember what we drank due to the fact I hadn’t seen Angie for about 5 years and we were having a good old chat! I remember it as a good place though, somewhere I’d definitely go back to. Which I did in 2014 with Angie and her other half, Juan. Again the food was nicely presented and original but occasionally a bit hit and miss in terms of flavour. However I remember really liking the Meloso (wet paella) with snails, quail and mushrooms. Juan selected an excellent Merlot from Penedes to go with it. A great spot that I would definitely like to go to again, which is true of all the restaurants in this post. At the end of Carrer de Quart, the continuation of Carrer dels Cavallers, you’ll find the Porta de Quart, one of only two remaining gates to the old town. Guarding the approach from the river, on the north east side of El Carme, is the more impressive Porta de Serranos. You can pay to go up the towers to get a view. I’ve made a separate post about Eating in El Carme. My map with everything on is here. See also my separate post on Street Art in El Carme for other things to see in the barrio. As previously mentioned, the Eixample is the residential area just to the south of the medieval old town. It has three sub-districts, Gran Via, Ruzafa (see separate posts) and this one; El Pla del Remei. The El Mercado de Colon is also in this zone but I’ve given its own post. My map is here. A small but high quality tapas bar and deli, since 1908. They can seat about twenty at tables in the back. I came at lunchtime for a mixed tuna salad which I couldn’t fault (A). There is an extensive wine selection available. This restaurant began by serving Fesoles (lima beans) to the urban poor in 1909 but it’s now a relatively posh restaurant. They are famous for their rice dishes but I didn’t have anyone to share one with so I ordered something smaller. To begin I had the Crujiente Relleno (crispy stuffing) on the recommendation of the nice waitress but unfortunately it was virtually flavourless (C) so I’m not sure what it was supposed to be stuffed with. Next I had the Corvina con Verduras a la Plancha (sea bass with grilled veg) which tasted and looked a bit oily and dirty from the grill (C). The Hoya de Castillo 2016, a Macabeo Merseguera blend, made things a bit better though (B-). I’d give them another try if I had no other choice as they have a good reputation, but this experience wasn’t special by any means. There’s plenty more fish in the sea though (see my other Valencia posts). El Pla del Real is the district due east of the old town, on the other side of the old Turia river bed. The Palau de l’Exposició de València housed the Valencian Regional Exhibition of 1909. It was designed by the architect Francesc Mora i Berenguer in a Neogothic modernista style. On the next block is the Art Nouveau Edificio de la Industria Lanera, now a Westin Hotel. Just a few blocks away is the Museu de Belles Arts de València (technically in La Saidia). While I’m not a fan of the building, I do quite like this cornerstone. See my and Mercado de Colon and Le Seu – Stuff to See posts for more Modernista architecture. Due to having too much content, I’ve made other El Mercat posts for La Lonja, Mercado Central and Other Stuff to See. My map is here. Tasca Angel (Elementary B+) at 1 Carrer de la Puríssima, is a classic (since 1946) stand-up tapas bar just around the corner from La Lonja. It’s a tiny place and always full to bursting, so they appreciate it if you keep reusing your glasses. We tried the All i Pebre (chunks of eel in a garlic and pepper sauce) and while it was a good example of this dish, I’m still not a fan of eel (B-). The sardines and brochettes here are good though. The famous La Pilareta aka Bar Pilar (Intermediate B+) at 13 Calle del Moro Zeit, is considered by many to be the best place in town to have Clochinas (Valencian Mussels). Clochinas are smaller and more yellow in colour than normal mussels and have more flavour. Both are on the menu so you can compare. I had them ‘al Vapor’ (steamed and served in a broth of, I think, garlic, bay leaves. black pepper and paprika) and they were great (B+). The Calamari, fried in a very delicate batter were excellent as well, some of the best I’ve ever had (A). The old chap in the pictures is showing us the gas powered machine that was used to refrigerate food in the old days. This is a craft beer pub in a quiet square a little away from the market. The service is friendly and their home brewed Tyris beer is pretty decent (B+) for €4.50 a pint. They have a small food menu as well and as I was bit peckish but not in the mood for a full meal, I tried something from their hot dog section. The Campero is a sizable local sausage that comes with fried onion and hefty slabs of tasty pickled gherkin in a good bread bun. It’s messy but hits the spot (B+) and wasn’t too pricey at €8.50. I visited in May 2017. Please see the separate post for eating in St Francesc. The alabaster front entrance, done in the florid Rococo style, is just stunning. The eyes of the two male statues either side of the door stare at you piercingly if you view them from immediately below. The palace was first constructed in the 15th century but was given a Baroque makeover in 1740. I’ve never actually been in to see the ceramics exhibitions, but have made it through the first front door to see the funny little statue of a child sitting on a goose. Please click on these images to see them in more detail. Also near the hotel in the Plaça de l’Ajuntament is the Art Deco central Post Office or Palau de los Correos. It’s worth popping in for a view of the nice elliptical glass dome but my favourite features are the lion head post boxes outside. The Plaça de l’Ajuntament is where people also come to view/hear La Mascletà, a deafening barrage of fireworks and crackers, which is held at 2pm each day of the five days of the famous Falles festival. Pyrotechnicians compete for the honour of conducting the final Mascletà on the last day of the festival (March 18th). The mayor gives orders and judges the competition from the viewing balcony of the town hall opposite the display. My friend Angie brought me here to experience the truly deafening din in 2014. The square was packed but we still got served easily at one of the bars. I needed a glass of Turia beer to steady my nerves! There are lots of other nice buildings around this part of town. The old Banco de Valencia on the corner of Career del Pintor Sorolla and Career de Don Juan de Austria is quite impressive. The latter street is a pedestrianised shopping area where you’ll find the ubiquitous but very useful El Corte de Ingles. Lots of other big brand shops can be found in St. Francesc if shopping is your thing. Just down the road is the at 4 Carrer de les Barques is the Hotel Palacio Reina Victoria which I believe is the city’s oldest hotel. Check out my La Seu – Stuff to See and Mercado de Colon posts for more nice architecture. San Francesc is one of six barrios in the Ciutat Vella (old town). It’s very centrally located, and is quite a safe area, which is why my employer likes to have us stay here. I’ve organised this post and all the others on Valencia on a barrio by barrio basis. 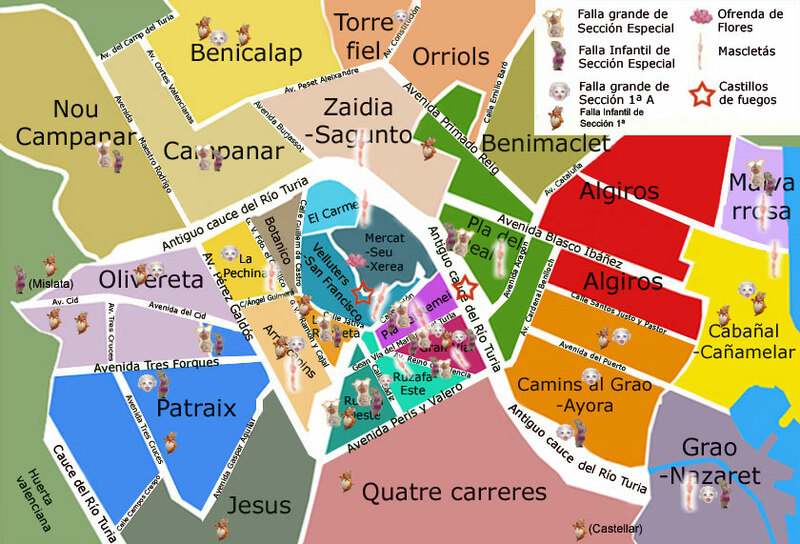 To help you understand where all the neighbourhoods are, here’s a map of the barrios, and my Google map of Valencia. Please see the previous post for Things to See in St Francesc. My employer invariably uses the Hotel Catalonia Excelsior (lovely staff, average rooms, ok breakfast). It’s next to a small and very pleasant square where you can sit and drink outside, although the bars there are quite expensive. A bit hard to find the first time you go but well worth the effort. Plain and simple tiled decor, friendly and plump staff (definitely a good sign) and very popular, so get there at 8 to avoid disappointment. The cooking is not haute cuisine by any means but homey comfort food, the kinds of things a Spanish granny would cook. For me, a very satisfying dish to start with is a bowl of murky Lentejas (lentil soup)(B+). For the main you can’t go wrong with the house speciality of Cordero al Horno (roast lamb) with chips and gravy (B+). They also have Platos Especiales del Dia (daily specials) which are usually classics like Cocido or Fiduea. Feeling daring one night I tried the sheep’s brains but once was enough!(C). The Rinones al Jerez are a bit grim too (C) but it’s all very cheap so I gave them a whirl. The house red (Cabellana) is dirt cheap but drinkability seems to vary by the bottle (C/D). You may want to fork out a bit more for something better. For afters I’d suggest some Frutta de Tiempo (grapes in a plastic cup?) or perhaps the Natillas (custard) or Flan (all B) and a glass of the wonderful local Moscatel (A). Total cost will probably come to around 20 euros which is dirt cheap in comparison to elsewhere. It’s all perfectly fine, just make sure you order the right things. Casa Mundo (Elementary B) at Carrer Juan de Austria, a pedestrian street in front of El Corte Ingles. Described by some as a ‘classic’ Valencian tapas bar it’s quite run down and there’s not much of an atmosphere. However it’s justifiably well-known for its fried squid which, with a caña, cost me €6.20 in 2008. It’s not a place to spend much time but it’s handy for the hotel and the squid is good. This is a good place to come and eat modern Spanish tapas. It’s the second tapas bar from famous chef Quique Dacosta who also owns Mercatbar (see Eixample – Gran Via post). I like it but sometimes I think form takes precedence over flavour. Still it makes for a change. Although very busy at other times, there weren’t many customers on the Monday I went. The MD was very nice and spoke English though other staff members didn’t really, not that they should have to. I was just feeling rusty as it was my first day in Spain for a while. On arrival I received some rather dry bread (C) and cream cheese (B). The ‘Yogur’ de Foie Gras y Frutas Secas, sealed in a glass jar, was different but not amazing (B). The Cebollita Roja com Emulsion de Anguilla, red-stained onion with a dollop of eel emulsion in the middle were visually very attractive and had a fair bit of flavour (B+). Next the Sushi with mango and lemon wasabi mayo was a winner (B+). However the Calderoso was tasteless and had strange crunchy bits which I didn’t appreciate (C). I wasn’t really impressed with any of the wines the sommelier suggested to accompany the first courses. The introductory cava (C+) and the following white (C) had no flavour although the Bobal red was okay (B-). To finish, the almond ice cream (A) and the sponge (B) went well together (A). Final glasses of Madeira (B) and Hierbas (B) sent me home pretty happy. I came here for lunch to celebrate my 48th birthday with my good friend Nicky. It’s generally seen as one of the best restaurants in town, the kind of place where ladies get a little pillow to put their bag on! It’s the third and poshest establishment in Quique Dacosta’s small group of restaurants, along with Mercatbar and Vuelva Catalina. We had the ‘Grace Kelly’ tasting menu of six dishes for €38. This began with Cebollita Roja com Emulsion de Anguilla, the same red onion with eel emulsion that I’d had downstairs some days before (B+). And continued with Parmesano con velo de albahacas ,parmesan with a ‘veil’ of basil (B). an oyster served with roe and a soya based sauce (A) , a deepfried cracker with minuscule prawns reminiscent of Cadiz’s Tortas de Camarones (B+), Cubalibre de Foie (a larger version than I’d had at Mercatbar and way too big (B) , La Gallina de los Huevos de Oro, an egg cooked in chicken broth with some gold foil which seemed pretty pointless (C) , Fideua Negra con Ajetes y Aire de All I Oli (short noodles cooked in squid ink and served with a foam of allioli, give me the real stuff anyday (B). To finish, Helado de Alemendras (almond ice cream with I think lavender ice cream as well (B-) and a few not particularly nice complimentary chocs and sweets to finish (C+). The bottle of Sauvignon Blanc and glasses of sweet Dolc de Mendoza were okay (B). It was all pretty good value really, and visually very appealing but the flavours weren’t there for me. I’d advise people to go to Ricard Camarena’s restaurant in Ruzafa for a better fine dining experience. Just over the road from Mercado Central is another favourite building of mine. La Lonja, or in Valenciano La Llotja de la Seda, (the Silk Exchange market) was built in 1482 and is a UNESCO world heritage building. Click on the photos to get a better view. I love the gargoyles and chimeras that run in arched columns around the doorways and adorn the window lintels. Some of them are quite cheeky! In the main hall, with it’s forest of twisted columns, is the entrance to the tower. Debtors were kept here as punishment which must have been purgatory during the hot Valencian summers. To the west of La Seu in the old town is the barrio of El Mercat where, not surprisingly, you’ll find the world-famous covered Mercado Central, Valencia’s principle market. It was constructed in 1914 by Francesc Guàrdia i Vial and Alexandre Soler in the Modernism style, and is adorned with brightly coloured ceramics and mosaics. My favourite bit is the cockatoo on the top of the central dome. This was once a run of the mill market bar but has now been taken over by my favourite Valencian chef Ricard Camarena whose other two establishments I have raved about in my Ruzafa post. It’s very popular and people often queue by standing behind the bar stools waiting for the person sitting to finish eating. I’ve even seen people tag team a space by taking turns eating half of a dish each. The lesson is, go just before or towards the end of normal lunch hours to get a seat, bearing in mind the market closes at 3pm. The food is fantastic as you’d imagine with so many quality local ingredients close at hand. I didn’t take notes but it was all A or A+. The bocadillo in the picture is called ‘El Canella’ and is made with morcilla, scrambled egg and pickled green peppers. I remember reading it once won European sandwich of the year although I can’t find any reference to such an award. If you’re lucky you’ll be served by the lovely Isabel, the hostess with the mostest. More on El Mercat in coming posts. La Seu is the most central barrio in the old town, between El Carme and La Xerea. It’s central point is Placa de la Mare de Deu from which runs Carrer dels Cavallers, the main street in the old town which is thronged with tapas bars. This post is about tapas bars. I’ve also written La Seu posts for restaurants, stuff to see in the area, and drinking horchata. My map is here. The city’s favourite cocktail is called Agua de Valencia which is made from gin, vodka, fresh orange juice and cava or champagne. This beautiful bar, decorated in a Baroque style, is definitely a good place to start a night on the town. ‘The Caves’ are just around the corner from Cafe de las Horas. This famous tapas bar gets its name from the three low-ceilinged rooms inside but there’s an outdoor area where if you can sit out in the sun. A young and trendy cava bar on the main drag. I tried it on a quiet evening and quite enjoyed the ‘tapas de mercado’, which in my case were canapes of morcilla and cured ham with camembert (A). One activity I thoroughly recommend is going on a tapas tour, especially if you’re on your own as I often am. My research led me to www.toursinvalencia.com which is run by Suzie Añon y García who is a certified tour guide. She does many different kinds of tours but I chose the eating tour in La Seu. A gang of eight of us (including four Londoners and two Swiss) went to three bars: La Huerta Santa Catalina, Blanquita and Tasca el Botijo, none of which were particularly historical or famous, they were just good ordinary tapas bars. The food was good and very reasonable (€30 with three drinks) and it was nice to meet some new people. The highlight of the evening was drinking from a Porron, a wine jug with a pointed spout that you hold high above your head while pouring the wine into your mouth. No mean feat, hence the bib! Plaza Santa Catalina is a small square in the Ciutat Vella adjoining the larger Plaza de la Reina, at the opposite end from the Cathedral. When you’re in the area you should try the famous Valencian drink Horchata. Horchata, or Orxata in Valceniano, is made from Chufas, know in English as Tiger Nuts, which in fact aren’t nuts at all but the edible tubers of a plant. Originally from Egypt, brought to the area by the Moors in the thirteenth century. The beverage even has its own local DOC with the best stuff coming from Alboraya, a nearby village. Built 200 years ago, this is the older of the two and the more beautiful with it’s lovely tiled interior. It’s a cool, peaceful place to escape the heat and bustle outside. I had my horchata (B+) with a Farton, a kind of lightly sweetened bread specially made for soaking up the horchata, which it did very well (B). El Siglo, 11 Plaza Santa Catalina. A mere 175 years old and not quite as attractive as its neighbour over the way, but still nicely decorated with ceramics and Art Deco lettering. Apparently locals consider the horchata to be better here, at least according to this blogger. My tastings were a year apart so I wouldn’t like to call it. Both were very refreshing (B+). The blog also has an interesting post on how horchata is made and where to get it from. Valencia has some great street art. A lot of it seems to be in the Ciutat Vella, especially El Carme. I read that the most instagrammed piece of street art is Moses by Blu at Plaça del Tossal. I’m not surprised, a huge beard of writhing snakes the size of a house is hard to resist. Mine and many other people’s favourite is David de Limón who does the Ninja men. If you’re on a PC you can click on an image to go to a full screen slide show. This is what I saw in 2017. Again, click to go big. There’ll be plenty more I’m sure! Extramurs is ‘the poor widening’ to the west of the old train station, El Estacion del Norte Valencia, as opposed to Eixample which was ‘the rich widening’ to the east. Its subdistricts are El Botànic, La Petxina, Arrancapins and La Roqueta. The train station itself is in La Roqueta, next to the city bullring. Built between 1906 and 1917 a stunning example of Modernism bearing many Valencian motifs such as oranges, La Albufera (the lake), barracas (traditional houses) and women wearing traditional costume. I love the mosaics in the ticket hall and waiting room inside. There’s talk of turning it into a museum but I think that would be a shame as it’s such a nice place to alight when arriving in the city. I came to this place in 2008. It’s a neighbourhood bar with excellent tapas that are cheaper than most other places. I had a doble and a plate of tellines (tiny angel-winged clams) for 5.20. The name would imply the snails are good too. The Eixample and Extramurs are residential areas organised on a grid system which lie respectively to the south and west of the medieval old town and its winding streets. Eixample is known as ‘the rich widening’ as opposed to Extramurs which is ‘the poor widening’. The Eixample is the area to the east of the train station, running along either side of Gran Via de los Germaines and its extension Gran Via del Marques de Turia. It has three sub-districts, Gran Via, El Pla del Remei and Ruzafa. In El Pla del Remei, the subdistrict north of Gran Via, you can find the stunningly beautiful Mercado de Colon on Calle Jorge de Juan. It was designed by Francisco Mora Berenguer who studied at the Barcelona School of Architecture and you can see the influences of Catalan architects such as Gaudi and Montaner in the structure. It’s no longer a fully functioning market but was restored in 2003 to house a cafe, a Camarena restaurant in the basement and a few small businesses. Efficient service as ever, but the restaurant doesn’t have much atmosphere and feels a bit formal. I had the Bunelo Cremoso y Crujiente de Bacalao con Emulsion de Miso (a codfish croquette with an emulsion of miso sauce), Croqueta al Pesto de Albahaca (basil pesto croquette). Also the Merluza a la Llama, Caponata de Verudras, Emulsion de Tomate y Habanero (flame-greilled hake with a veg caponata in an emulsion of tomato and chilli). Also the Esparragos Verdes en Tempura, Ras El Hanout y Crema de Yogur Griego (green asparagus in tempura with greek yogurt cream and ras el hanout) which was tasty but the half portion was huge so it wore a bit thin after a while. With a bottle of La Ola del Melillero, a PX and Moscatel blend, the final bill came to €51. As you may know already I’m a big fan of Ricard Camarena and have raved about three of his other establishments elsewhere on this blog (see the Russafa and Mercat Central posts) but this experience wasn’t quite as good (all Bs) which was a little disappointing. I’ll always love this building though. One Sunday I took a walk over the river to Benimaclet to see the ‘Cases de Trencadis’ which translates badly as ‘The Tiled Houses’. Actually Trencadis refers to a type of mosaic made of broken pieces of ceramic tile. This technique was used by Catalan modernism architects, most famously by Gaudi and Jujol in Parc Guell in Barcelona. These houses were built in the 1930s by Jose Sanmartin Zarzo, an uneducated bricklayer with no formal training in architecture, in tribute to Gaudi. Zarzo collected leftover tiles from the building sites he worked on to create the façades. The corner building is now a fruit and veg shop but it was closed on the day I went. You can read more about the houses and other places in Benimaclet on this website.